Mix the Masarepa with water according to the directions on the packaging. Each brand has slightly different ratios. Tips for finding Masarepa: Look with the Spanish or Mexican food. I have found it at many major grocery chains. There are a few different brands, but make sure it says Precocida or pre-cooked corn meal. Make thin rounds out of the dough, about 1/3 inch thick. Cook in a dry cast iron skillet on medium/high until it is browned on both sides. Split with a fork, keeping half of the edge intact, making a pocket. Meanwhile, cut the onions, peppers, garlic and chiles. Remove the seeds from the chiles if you dont want it to be as spicy. Brown the ground beef and drain most of the oil. Remove from the pan and set aside. Cook the onions and peppers in some oil. Salt. When they start to brown, add the garlic and chiles. Add in the cooked beef and stir to coat everything. Next add the spices followed by the tomatoes and hot sauce. Rinse the beans and add. Simmer for 15 minutes to get the flavors all blended. 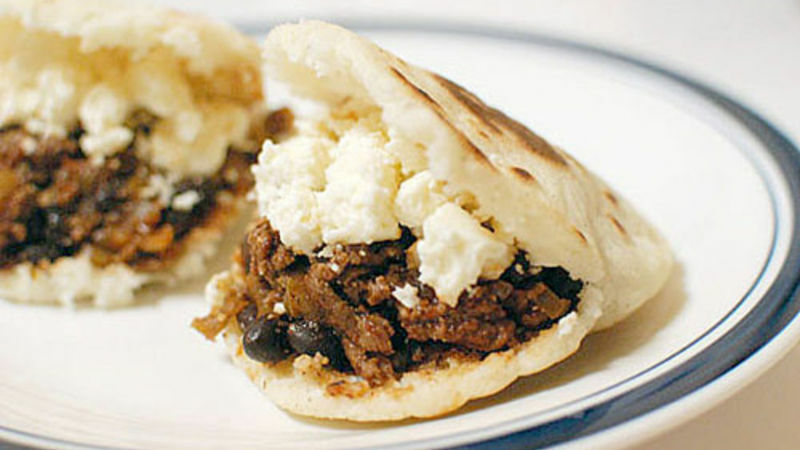 Fill the Arepas with the beef and bean filling and add some crumbled queso. Serve!